The first decision that you need to consider is the transportation of your pet. It is a common decision to have me come to your home or your vet to receive your pet. Emotionally, it can be very difficult to prepare your pet to be transported and to drive your vehicle after having just experienced the loss. It can also be a bit dangerous to drive when you are not fully mentally focused on the task of driving but are instead rehashing the last moments you shared with your pet. Especially with large dogs, you probably do not have the proper equipment and supplies to accomplish the transportation with the dignity you want to give your pet. Some families want to take their pet home after an in-office euthanasia to grieve quietly and privately with the body present. You may also want to have remaining pets sniff or otherwise investigate the passing. If this is what you want to do, there is no reason not to. If you have decided to provide palliative care and are waiting for the passing to occur naturally, call me whenever your pet has passed and we will make arrangements as quickly as possible. If you are facing a home euthanasia, calling me to make arrangements ahead of time will allow us to meet when you need me. While there is no need to rush with the disposition of the body, you may want to limit the amount of time you keep your pet unpreserved in your home. Especially during warm weather, you should try to finalize your decisions and have your pet received by me within no more than 8 to 12 hours after the passing. The timing for the completion of the cremation is another important decision to consider. Chartiers Custom Pet Cremation offers a number of different time frames to meet the needs of your family. I can offer completion of the cremation either within forty-eight hours of receiving your pet or within two weeks of receiving your pet. At certain times, it is possible to have the cremation completed within six hours of receiving your pet. Sometimes the death occurs when a significant family member or members are out of town and the family wants to delay the cremation until that family member is in town and can arrange for a final goodbye. I can accommodate this waiting time for your family. How do I know that I am receiving my pet back? Chartiers Custom Pet Cremation is owned and operated by one person at one location. Once your pet is received into my care, your pet never leaves my care. 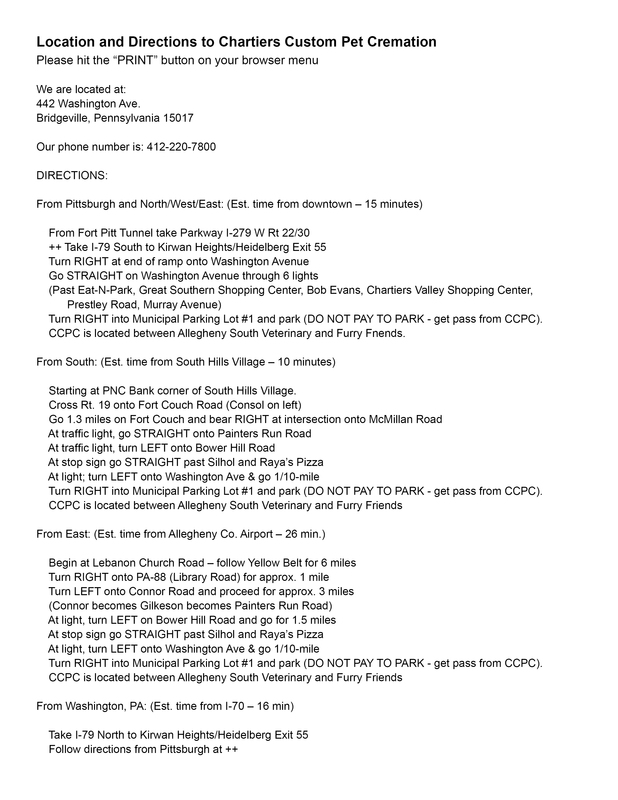 The cremation is performed at my location in Bridgeville by me. I carefully attend to every detail of your pet’s cremation, until I return your pet to your hands. For some families, a more involved approach is desired. These families choose to have an attended cremation. With this choice, you are present here at the crematory to witness the cremation process. Some families find that it is enough to give a final kiss goodbye while others view the entire process from start to finish. I explain each part of the process and let you decide what you want or don’t want to see. There is a comfortable living room area that provides a cozy space for you to relax in during the cremation. An attended cremation may be available when you call but since it requires the exclusive dedication of four and one half to five hours of our time, it usually needs to be scheduled. In the meantime, I can receive your pet and preserve the body until the start of the attended cremation. The reason Chartiers Custom Pet Cremation exists is to provide cremations where every pet’s cremains can be returned to the family. I do not perform mass or common cremations. I do not work for any funeral home or veterinarian—I only work directly with you, the family of the pet to whom I am providing care. Your family can depend on the fact that your pet will never leave my care until I place your pet in your hands. In states where there is a certification requirement, there is a Crematory Operators Certification Program sanctioned by CANA (Cremation Association of North America). Even though the State of Pennsylvania does not require crematory operators to be certified, I have achieved this certification. Preparation of the cremains for return to your family is where Chartiers Custom Pet Cremation is different from any other pet cremation service. 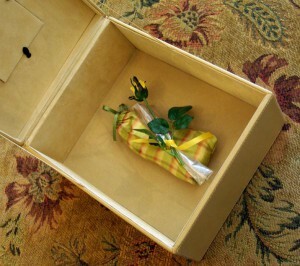 Many pet cremation services return your pet in a generic cardboard box, metal tin or even just a paper bag. When you have your pet cared for by Chartiers Custom Pet Cremation, a lovely comforting presentation is the standard. Before the cremation, I snip a little of your pet’s fur/feathers and wrap them around a silk rose bud for return to you with the cremains. The cremains are first placed in a heavy sealed bag to keep the cremains secure. 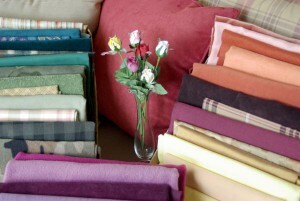 The cremains are then placed in a fabric bag that I hand make specifically for your pet. I can make this from fabric I have and you may chose a color from the over 100 fabrics available here. If you would prefer, you can provide fabric that I can use to make this bag. In the past, families have provided fabrics that have a special meaning to the family such as a favorite blanket, the cover of the pet’s favorite pillow, a neckerchief, the pet’s winter coat, a hunting jacket, or some other fabric that had a special meaning. The fabric bag allows you to carry the cremains for sprinkling, inter the cremains for burial, enclose the cremains in an urn or keep the cremains to be buried with a family member. This preparation is included in the cost of the cremation and is especially important since it allows you to take the cremains home when they are ready and defer any other memorial purchases until a time when you are emotionally ready to consider them. Returning your pet to your hands is extremely important. Returning your pet to your hands is extremely important. I do not mail cremains—we can either meet at your home or at my location in Bridgeville to return your pet to you. In time, your family needs to consider how you would like to memorialize your pet. The cremation process allows you as much time as you need to make these decisions. You may choose to scatter the cremains along a favorite path, bury the cremains in a special spot or with a deceased family member or keep the cremains in your home. I have urns in every price range and in a huge variety of materials. 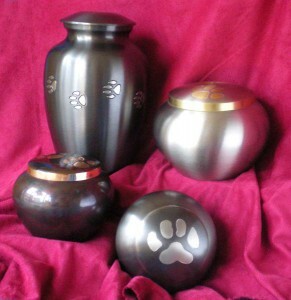 Another section of this web site has more information on urns that are available through Chartiers Custom Pet Cremation. Many items can be purchased so that you can have your pet’s cremains in them for you to take home. For some families, taking care of everything at once is a comfort. However, some families find that because there are so many variables to consider when selecting an urn, they need to postpone this decision until a time when their grief is not so overwhelming and they are better able to give the purchase more thought. Chartiers Custom Pet Cremation is all about giving you and your family choices as well as the time to make the choice that best suits your needs. There is no charge to attend either event and you will receive an invitation to attend each. Further information on these two events can be found on the web site at Pet Memorial Sunday and Healing Hearts. Elizabeth Babcock, one of the speakers who has provided families with information and comfort during Pet Memorial Sunday and Healing Hearts, prepared an article about grief. She developed this article from her notes from those presentations. Our society does a terrible job communicating about and preparing us for grief and it is her mission to help families validate their feelings of loss and bewilderment that often accompany the loss of a pet. When we talked about setting up this link, she remarked that while the article can equally apply to families experiencing the loss of a human or animal family member, she wanted families to know that grief is grief and that the loss of a relationship is a trauma no matter what the species of companion that you have lost. Because our pets are such an integral part of our daily life, the grief experienced upon the loss of your pet may even be more intense than grief occurring during the loss of a human family member. 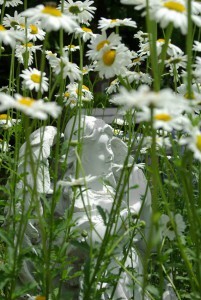 I invite you to read her article at Grief: What All Mourners Need to Know. From your initial grieving through the days of remembering and honoring your pet’s gift of life, Chartiers Custom Pet Cremation is here to see that you have choices and to fulfill your need to have your pet treated with respect and care. While I cannot prevent the feelings of loss and sadness, by making arrangements that suit your needs, I try to provide a soft place to cushion the hard fall of grief. I would like to encourage you to call me (412-220-7800) and talk with me about your needs so that you can make the choices that are physically, emotionally, and financially right for you, your pet and your family.